One of the “iconic moments in American history” is scrutinized in heroic detail. Gardner’s books previously took on such iconic figures as Jesse James (Shot All to Hell: Jesse James, the Northfield Raid, and the Wild West’s Greatest Escape, 2014, etc. ), Pat Garrett, and Billy the Kid. He writes that Theodore Roosevelt believed Spain was an Old World, “weak and decadent” relic, its occupation of Cuba outrageous. Roosevelt was assistant secretary of the Navy when the Spanish-American War broke out in 1898. Ambitious, intense, and energetic, he had been aching to be in a war—“nothing was going to keep him from the battlefield.” He resigned his position and a month later was off to Texas to join the First United States Volunteer Calvary as second in command, a 38-year-old lieutenant colonel. 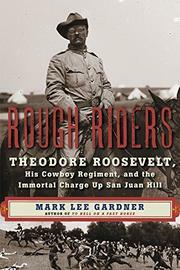 The Rough Riders, as newspapers called them, were a “ragtag regiment of Southwestern cowpunchers, Oklahoma Indians, Ivy League football stars, and champion polo players.” Roosevelt loved it: “I put myself in the way of things happening, and they happened.” They arrived by boat at Santiago in June. After experiencing some action, the penultimate event took place on July 1. Roosevelt, astride his horse, Little Texas, led his men up the hill yelling “Forward, March!” bullets from the Spanish soldiers’ rifles whistling by. One soldier wrote home: “I really believe firmly now, that they cannot kill him.” They took the hill but suffered casualties. The “splendid little war” lasted 10 weeks, and Roosevelt was elected governor of New York a year later. Numerous quotes from letters, journals, and memoirs bring this adventurous story to life. There are many books about this event, including Roosevelt’s own. Gardner’s short-paragraphed, fast-paced, and thoroughly researched addition will appeal to teens as well. A rousing and robust story about the immortal charge and the significant role played in the war by Theodore Roosevelt, the only American president to be awarded the Medal of Honor.